The CHATILLON® MSE100-M Series mechanical dynamometer is ideal for ergonomic evaluations, job task analysis, functional capacity and muscle strength analysis. The MSE100 Series features a large, 2.25-inch dial for improved resolution and readability, peak hold button, ergonomic shape and improved accuracy of +0.5% of full scale. The MSE100 is an excellent, economical solution for tensile (Pull) or compression (Push) testing. MSE100 Series gauges come with protective carrying case and handle assembly. 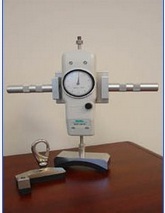 A Certificate of Calibration with Data is supplied standard. The MSE100-M can be used with these optionally available testing kits: the FCEK kit has accessories for functional capacity testing and job task analysis; the MSCK kit has accessories for muscle strength evaluation.